Like all game meats, a rabbit is very lean, and the more worked muscles, like the legs, take a longer time to cook than the saddle (the breast meat), which cooks relatively quickly. 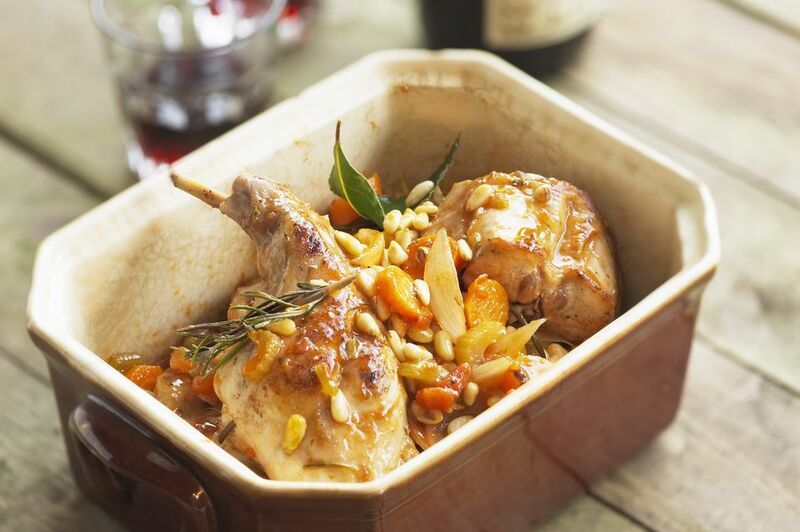 Rabbit legs need to be braised or stewed to tenderness and should be separated from the saddle. In general, a rabbit is cut up into 8 serving pieces: four legs and the saddle, quartered. You'll need a sharp chef's knife, a sharp paring or boning knife, and kitchen shears. You can also use a cleaver to do some of the whacking work that your chef's knife will do. Depending on where you bought the rabbit, you may need to cut off its head first at the base of the neck. A cleaver comes in handy since you can give it a good whack and use your chef's knife to cut through entirely. You can also use your chef knife's and apply pressure in a downward, sawing motion. Save the head for soup stock or discard. Lay the rabbit on its back. Hold a foreleg in one hand, then keeping your knife flush against the rib cage, cut the flesh connecting the foreleg to the shoulder. The foreleg isn't connected to the bone, so this is easy to do. Repeat with the other foreleg. Removing the hind legs is similar to removing chicken legs. Push down on the rabbit's spine to give you clear sight of the thigh muscle connecting to the pelvis. Cut through the thigh, exposing the ball joint of the thigh bone as shown in the photograph. Bend it back so the ball joint pops out (as shown in the photograph). Cut the meat around the leg, turning the carcass, to separate the leg from the tail joint. Repeat with the other hind leg. There's little meat on the pelvis, so it's best to just chop it off and throw it into your stock pot or saucepan for stock or sauce. Count two ribs up from the tail, and using your cleaver or chef's knife, chop between the second and third ribs. If you're using a chef's knife, press down on the back of the knife with your palm and push downward. You can use shears or your boning knife to completely separate the pelvis. This cut will release the flap meat on either side of the carcass. Turn the carcass spine-side up, then press down and flatten the spine with the palm of your hand. Using the cleaver, cut the carcass in half horizontally down the spine. Again, you can use your chef's knife, but you'll need more pressure to run the knife down the spine, cracking the rib bones as you go. As you would do for cutting up a chicken, use kitchen shears to cut out the backbone on both sides of the carcass. Save the backbone for soup stock or sauce. Using the cleaver or chef's knife, cut across the saddle horizontally just below the saddle where the flap meat is connected. Cut this lower portion in half vertically. Cut the upper portion of the saddle in half vertically, which now gives you four saddle portions. Your rabbit is now cut up and ready to cook!